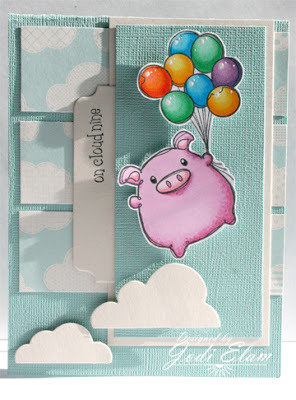 I thought I'd post this little cutie for a challenge over at the Greeting Farm.I've always loved this little piggy and I know he's retired now, but that doesn't mean he can't be shown off. I think he's a doll (yes, I've decided the little piggy is a "he"). I colored him with Copics and fussy cute him. The flat bottom cloud dies are from My Favorite Things and is the tab die. The print paper is by Jillibean. Too cute!! I love all of the clouds and the pretty shade of blue! Thanks for joining the TGF challenge!